Hutter, Manfred. 2018. Rivalität und Konflikte zwischen Christen und Zoroastriern. Schweizerische Zeitschrift für Religions- und Kulturgeschichte 112. 91–104. The encounter of Christianity with Zoroastrianism in the Sasanian Empire started already in the 3rd century. But it was only since the 5th century that a sizable number of Zoroastrians, mostly from the upper classes, converted to Christianity. This led to reactions by the Zoroastrian clergy against the adherents of the agdēn, the «false» or «bad» religion, as this religion was seen as unfitting to Iranian culture. Thus, Middle Persian texts discuss the necessity to avoid contacts with members of agdēn. This term is not restricted to Christianity, but can also be applied to other religions. It is only from the early Islamic period in Iran that two Middle Persian texts, the Dēnkard and the Škand Gumānīg Wizār, discuss (and refute) Christian teachings more systematically. The reason for this theological discussion about Christianity can be seen in the minority situation which Zoroastrianism faced in the Islamic period. Hämeen-Anttila, Jaakko. 2018. 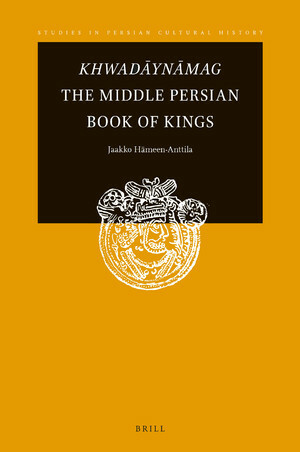 Khwadāynāmag: The Middle Persian Book of Kings (Studies in Persian Cultural History 14). Leiden: Brill. The Khwadāynāmag is often conceived of as a large book of stories, comparable to Firdawsī’s Shāhnāme, but Hämeen-Anttila convincingly shows that it was a concise and dry chronicle. He also studies the lost Arabic translations of the book, which turn out to be fewer than hitherto thought, as well as the sources of Firdawsī’s Shāhnāme, showing that the latter was only remotely related to the Khwadāynāmag. It also becomes clear that there were no separate “priestly” and “royal” Khwadāynāmags. صادق هدایت. ۱۳۹۶. ره‌آورد هند: برگردان هفت متنِ پهلوی به فارسی. تهران: کتاب کوله پشتی. به‌کوشش: خسرو كيانراد. سفر صادق هدایت به هند و اقامتش در بمبئی که حدود یک سال (١٣١٥-١٣١٦خ.) به طول انجامید، به‌جز انتشار رمان «بوفکور» دستاورد دیگری نیز برای او به‌همراه داشت و آن فراگیری زبان و خط پهلوی و ترجمه‌ی چند متن از پهلوی به فارسی بود. برخی از این متون در هند و برخی در بازگشت به ایران ترجمه و در قالب کتاب‌ها و مقالات پراکنده‌ای منتشر شدند. چندی از این ترجمه‌ها امروزه نایابند و در دسترس نیستند. از آنجا که سال‌های زیادی از ترجمه‌های هدایت می‌گذرد و در این مدت دانشمندان و زبان‌شناسان دیگری هم به سراغ این متون رفته‌اند، در مقدمه‌ی کتاب حاضر ضمن اشاره به دیگر ترجمه‌ها و پژوهش‌های صورت گرفته، خوانش هدایت در برخی موارد ازجمله اصطلاحات، اسامی خاص جغرافیایی و اشخاص مورد بررسی قرارگرفته و گاه پیشنهادهایی مطرح شده است. عناوین این متون که در کتاب حاضر برای نخستین‌بار به‌صورت یک‌جا و در مجموعه‌ای مستقل گردآمده‌اند عبارتند از: «گجسته ابالیش»، «زندِ وهومن‌یسن»، «شهرستان‌های ایران»، «کارنامه‌ی اردشیرِپاپکان»، «گزارش گمان‌شکن»، «یادگار جاماسپ»، «آمدن شاه بهرامِ ورجاوند». Hedayat, Sadeq. 2018. Rahāvard-e Hend. Edited by Khosro Kiyanrad. Tehran: Ketab-e KoolehPoshti. Terribili, Gianfilippo. 2017. Dēnkard III Language Variation and the Defence of Socio-Religious Identity in the Context of Early-Islamic Iran. Open Linguistics 3(1). The aim of the present paper is to illustrate as a case study, the linguistic and stylistic peculiarities characterizing the third book of the Dēnkard, one of the most authoritative texts in Zoroastrian Pahlavi literature (9th-10th CE). The analysis will consider these features as part of a coherent system, styled to serve the dialectic strategies pursued by the Zoroastrian high priests in response to the pressures their own community was facing in the early Islamic period. In order to provide a more comprehensive overview on DkIII language distinctiveness, the research will underline the outward/inward dynamics, addressing both the relation of this theological dialectic with the surrounding socio-cultural environment and the leadingrole claims of a group within a politically subordinated community.